Anyone dreading traffic chaos during the Olympics can breathe a (very slight) sigh of relief with the news that the dedicated VIP lanes could be opened up to the public after all. City Hall announced that the controversial routes, which will allow the ‘Games Family’ – officials, sponsors, VIPs and media – fast movement between key venues during the games, will be made available to private users when Olympic traffic is scarce. A meeting between TfL and Games organisers came to the agreement that mobile traffic signs will alert regular road-users of changes if the dedicated lanes are expected to free up. This announcement from the Mayor’s camp comes after a pile up of transport concerns in anticipation of the Olympics, which has resulted in Boris slumping behind Ken in the mayoral election race. Boris may be worrying that he will be booted out of the VIP lanes too, if he cannot provide some relief from the ‘car-mageddon’ expected if Tube strikes materialize and the Olympic Route Network remains out of the public’s reach. One piece of good transport news might be just the ticket to launch him back into the lead – but this is not it. 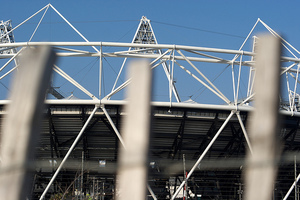 An official from the Olympic organising committee, LOCOG, admitted the traffic relief will be limited, with most lanes “highly unlikely” to be opened up during the games. Routes will remain very busy throughout with ‘official’ traffic which, organisers revealed, will include the chairman of McDonalds as well as Seb Coe and Usain Bolt. If Boris fails to iron out the transport problems by 3 May, he might find himself stuck in the congested pleb-lanes with the rest of us. Londoners will have to pray that Boris’ stock drops even lower, forcing the white-haired warrior to bring out the emergency measures. Regent Street monorail anyone?